This is the most tender, aromatic and colourful braised dish you can possibly have on your plate at this time of year, at least in the Northern hemisphere. 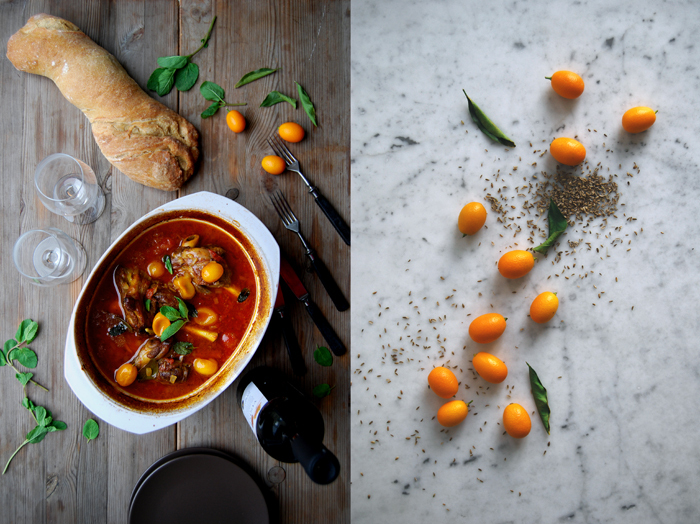 Cardamom, cumin, fennel and coriander seeds refine the deep red juices of summery (tinned) tomatoes cooked with succulent lamb shanks before tiny yellow kumquats add their bittersweet fruitiness. The fresh mint leaves on top are more than just pretty in this warming composition, their job is to freshen it up! A sheer explosions of aromas! Over the years, I have become a big fan of shanks in my kitchen whenever I’m in the mood for a stew. Be it beef, veal or lamb, I prefer this cut over chuck steaks. The meat around the bone is packed in fat which keeps it juicy and tender while it braises in a fragrant broth of wine, fruit and vegetables. 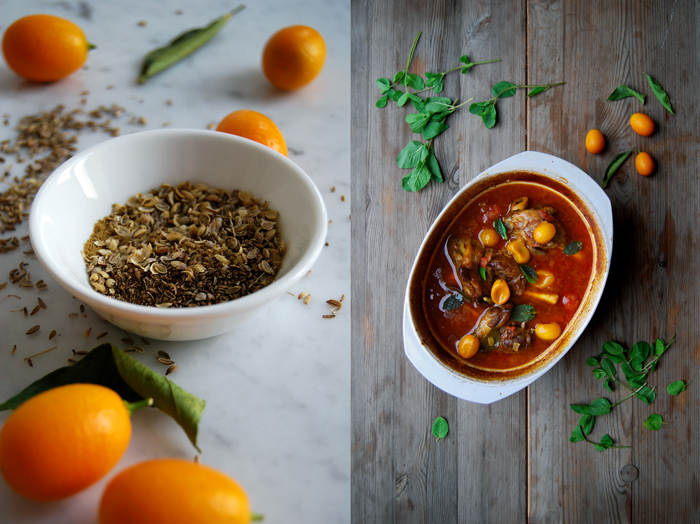 Shanks usually taste quite strong, they can easily deal with spices and herbs, perfect for Mediterranean comfort cooking with lots of rosemary, thyme, sage and garlic, or to find some inspiration in the Arabic cuisine. All those spices, those warming corns, pods and powders, cumin, turmeric, cayenne, cinnamon and many more, this is the best moment to let their qualities shine. Spices are great on their own but even better in a team. Be experimental, combine your favourites and use a little bit more than you usually would, the meat and sauce can take it! You need an oven proof dish / casserole dish with a lid for this recipe. In a casserole dish, heat a splash of olive oil and sear the shanks for a few minutes until golden brown on all sides. Take the meat out and set it aside but keep the casserole dish on the heat. Add a little more olive oil and the fennel seeds, coriander, cardamom and cumin, cook for about 20 seconds on medium heat or until you smell the spices, stir constantly. Add the onions and garlic and cook for 1-2 minutes. Mix the lamb shanks with the spices and onion and pour the wine over the meat. Season with salt and pepper. Add the orange peel, bay leaves and tomatoes, chop them roughly, mix everything and bring to a simmer. Close the casserole dish with a lid and cook in the oven for 1 1/2 hours. Add the kumquats (whole, not cut) and cook for another 30 minutes or until the meat is tender and you can lift it with a fork off the bone. If necessary, take out the meat when it’s done and cook down the sauce. 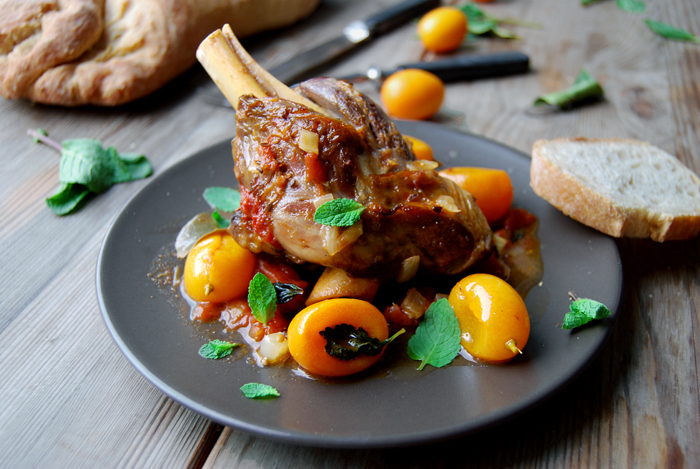 Season to taste and serve with fresh mint leaves and thick slices of white bread or flatbread. 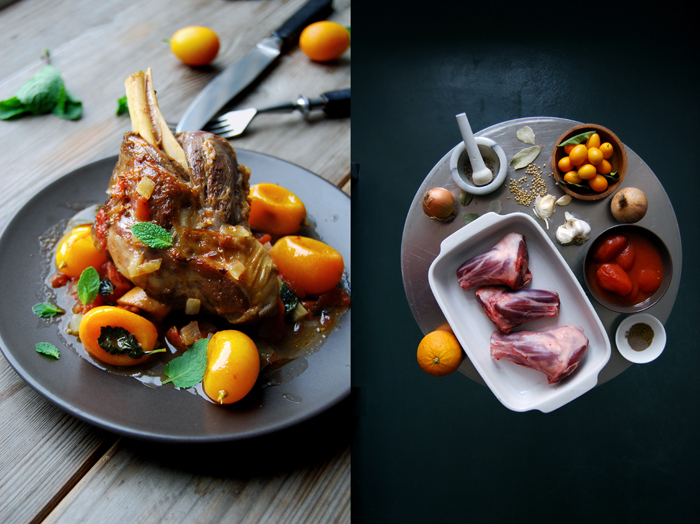 i could eat lamb shanks all day, any day. 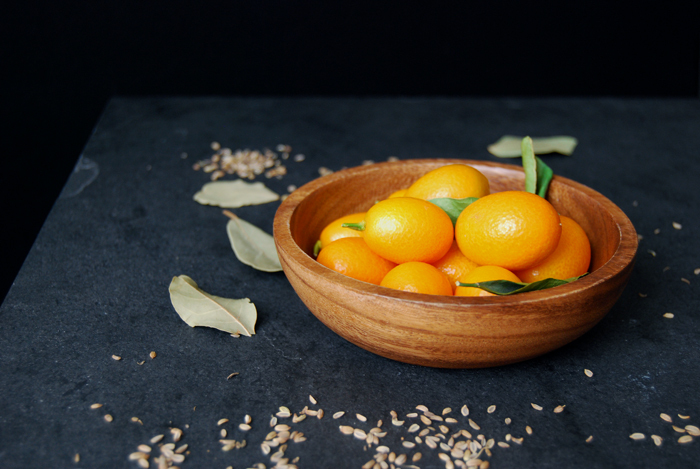 i can only imagine the kumquats must take this dish into the most wonderful of places. immediately placed onto my eat-really-really-soon list. How many pounds is each shank?